There are many muscles in the forearm. In the anterior compartment, they are split into three categories; superficial, intermediate and deep. In general, muscles in the anterior compartment of the forearm perform flexion at the wrist and fingers, and pronation. The superficial muscles in the anterior compartment are the flexor carpi ulnaris, palmaris longus, flexor carpi radialis and pronator teres. They all originate from a common tendon, which arises from the medial epicondyle of the humerus. Attachments: Originates from the medial epicondyle with the other superficial flexors. It also has a long origin from the ulna. It passes into the wrist, and attaches to the pisiform carpal bone. Actions: Flexion and adduction at the wrist. This muscle is absent in about 15% of the population. Attachments: Originates from the medial epicondyle, attaches to the flexor retinaculum of the wrist. Actions: Flexion at the wrist. Attachments: Originates from the medial epicondyle, attaches to the base of metacarpals II and III. Actions: Flexion and abduction at the wrist. 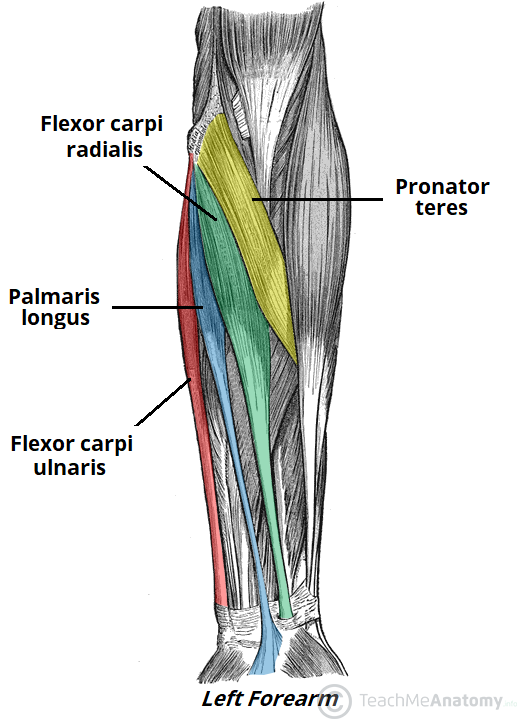 The lateral border of the pronator teres forms the medial border of the cubital fossa, an anatomical triangle located over the elbow. Attachments: It has two origins, one from the medial epicondyle, and the other from the coronoid process of the ulna. It attaches laterally to the mid-shaft of the radius. Actions: Pronation of the forearm. 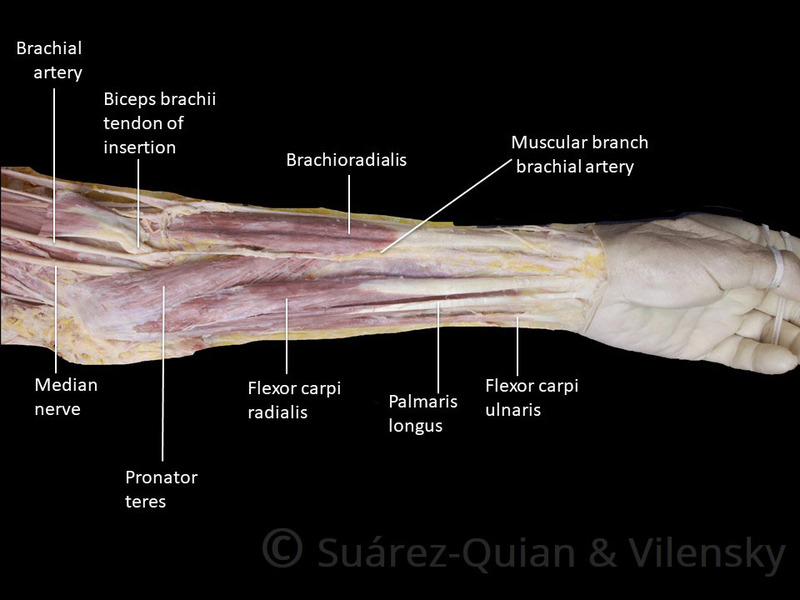 Fig 1 – The superficial muscles of the anterior forearm. The flexor digitorum superficialis is the only muscle of the intermediate compartment. 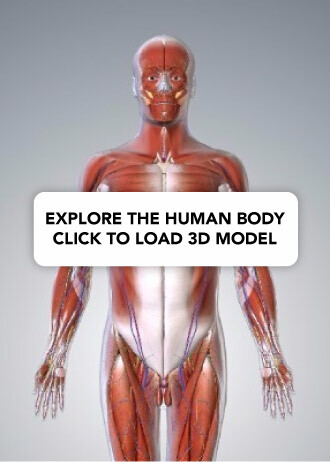 It can sometimes be classed as a superficial muscle, but in most cadavers it lies between the deep and superficial muscle layers. The muscle is a good anatomical landmark in the forearm – the median nerve and ulnar artery pass between its two heads, and then travel posteriorly. Attachments: It has two heads – one originates from the medial epicondyle of the humerus, the other from the radius. The muscle splits into four tendons at the wrist, which travel through the carpal tunnel, and attaches to the middle phalanges of the four fingers. Actions: Flexes the metacarpophalangeal joints and proximal interphalangeal joints at the 4 fingers, and flexes at the wrist. There are three muscles in the deep anterior forearm; flexor digitorum profundus, flexor pollicis longus, and pronator quadratus. Attachments: Originates from the ulna and associated interosseous membrane. At the wrist, it splits into four tendons, that pass through the carpal tunnel and attach to the distal phalanges of the four fingers. Actions: It is the only muscle that can flex the distal interphalangeal joints of the fingers. It also flexes at metacarpophalangeal joints and at the wrist. Innervation: The medial half (acts on the little and ring fingers) is innervated by the ulnar nerve. The lateral half (acts on the middle and index fingers) is innervated by the anterior interosseous branch of the median nerve. This muscle lies laterally to the FDP. Attachments: Originates from the anterior surface of the radius, and surrounding interosseous membrane. Attaches to the base of the distal phalanx of the thumb. Actions: Flexes the interphalangeal joint and metacarpophalangeal joint of the thumb. Innervation: Median nerve (anterior interosseous branch). A square shaped muscle, found deep to the tendons of the FDP and FPL. Attachments: Originates from the anterior surface of the ulna, and attaches to the anterior surface of the radius. 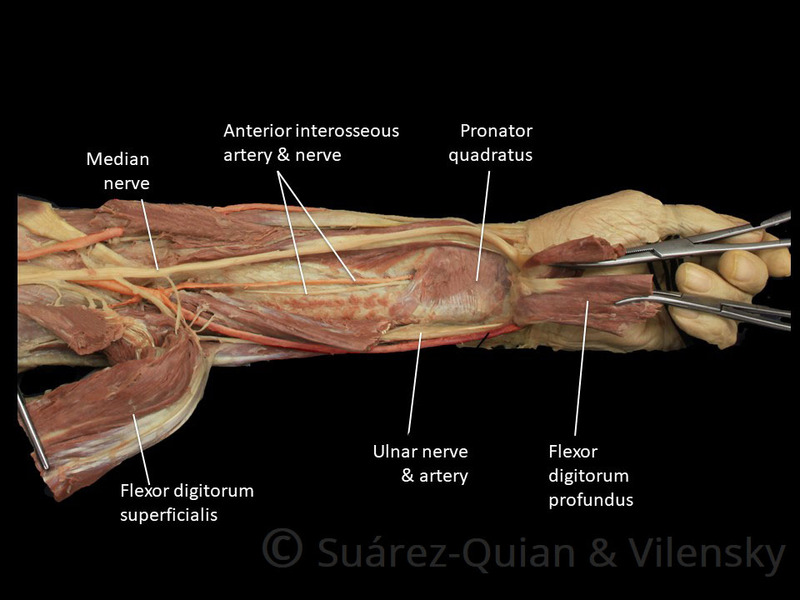 Fig 2 – Deep flexor muscles of the anterior forearm. Prosection 1- The superficial layer of the anterior forearm. Prosection 3 – The deep layer of the anterior forearm. The illustration below demonstrates the anterior forearm muscles. Which muscle is demonstrated in green? 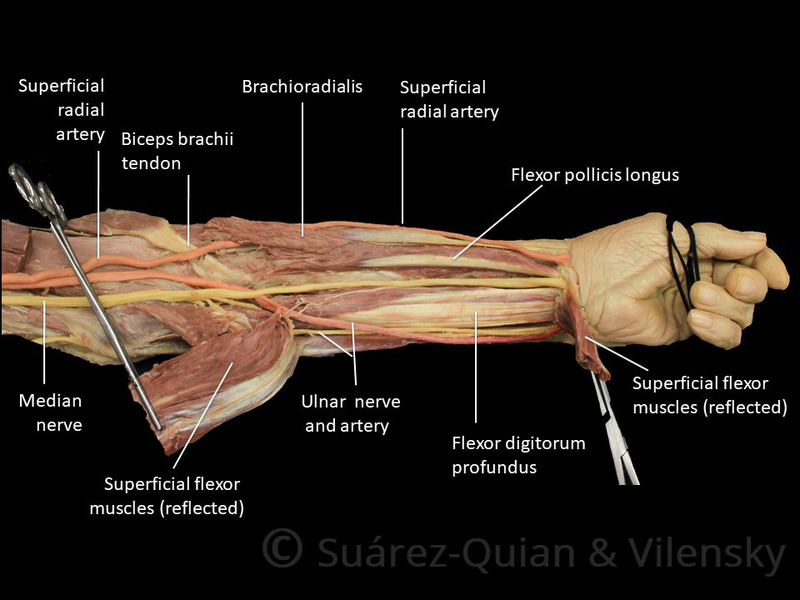 Where do the superficial muscles of the anterior forearm originate? Which nerve innervates the flexor carpi ulnaris?